Campbell’s Soup announced plans to release four limited-edition cans of its condensed tomato soup featuring colorful labels reminiscent of Andy Warhol’s famous Pop Art paintings. The campaign will celebrate the 50th anniversary of Warhol’s original series of soup-can masterpieces, which consisted of 32 canvases illustrating various Campbell’s soup cans in psychedelic color combinations. These special cans will be sold at most national Target stores starting today. MediaPost.com reported on the details of this inspired branding initiative. Campbell’s Soup has also added digital and social media elements to the promotion with the creation of the website, ArtofSoup.com, and an app that allows people to give their personal photographs the impact of Warhol-esque color. Users can then share their vibrantly enhanced photos with their friends, with some images selected as cover photos for the Campbell’s Condensed Facebook page. The final campaign component is Campbell’s appointment as the education sponsor for the “Regarding Warhol: Sixty Artists, Fifty Years” exhibition debuting September 18 at The Metropolitan Museum of Art. 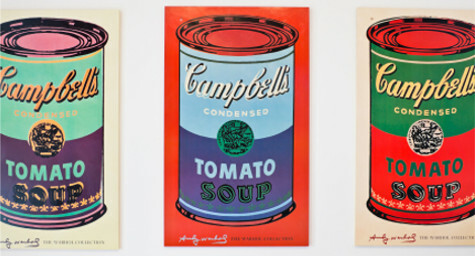 Campbell’s Soup ultimately deserves credit for helping to launch Warhol’s iconic career since his soup-can series was the highlight of his very first solo gallery exhibition in 1962. Despite the fact that the artist was considered too avant-garde for the brand’s wholesome image, Campbell’s Soup supported his talent by commissioning two paintings, beginning the Andy Warhol Scholarship Fund at the New York Art Academy and sending him numerous cases of the tomato soup that helped make him a star. To learn how creative packaging can increase your brand appeal, contact MDG Advertising today call 561-338-7797 or visit mdgadvertising.com. MDG Advertising, a full-service Florida advertising firm with offices in Boca Raton and New York, NY, specializes in developing targeted Internet marketing solutions, exceptional creative executions and solid branding and media buying strategies that give clients a competitive advantage. Our core capabilities include brand development, logo design, creative, digital marketing, print advertising, media planning and buying, TV and radio, public relations, Web design and development, email marketing, social media marketing and SEO. Our core capabilities include branding, packaging, logo design, creative, digital marketing, print advertising, media planning and buying, TV and radio, public relations, Web design and development, email marketing, social media marketing, and SEO.